Me have really great time at fun tribal festival race today. First, husband make picture back at cave home of Barefoot CaveWoman ready to run. Come, husband! Not be late for race! Barefoot CaveWoman feel cold. Hopes big sun disk warms up ground so feet don’t hurt. Barefoot CaveWoman is happy outfit matches falling tree leaves. Barefoot CaveWoman likes outfits to match seasons. Barefoot CaveWoman believes idea of layering for seasonal warmth will catch on. Become classic! Barefoot CaveWoman arrives at big race She take big look around. Race by big river. Lots of people. Much competition for food. Barefoot CaveWoman confused by strange foot coverings on people at race. Barefoot CaveWoman see people attach funny thing on foot coverings. Barefoot CaveWoman attach funny thing to ankle. Barefoot Cavewoman take a look at starting path for race. Time to line up. Barefoot CaveWoman look for husband. Husband wearing disguise. Husband no want foot-cover people see him with cave wife. Barefoot CaveWoman recognize husband. Gives picture-making box to husband. Husband try to make picture of Barefoot CaveWoman starting race. He try and try. Good man! But no Barefoot CaveWoman in pictures. Man in red coat in all pictures look like Barefoot CaveWoman’s father, but no way. Father is far away. Barefoot CaveWoman start back of pack. Feet Cold. Hard surface hurt when feet cold. Barefoot CaveWoman keep going. Many many people pass Barefoot CaveWoman. But Barefoot CaveWoman use technique. Foot-cover people moving very fast, flow like river around Barefoot CaveWoman. Barefoot CaveWoman know what to do. Barefoot CaveWoman know it get better after one mile. 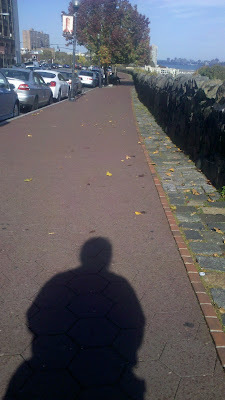 At one mile, big sun disc shining on path. Path warms Barefoot CaveWoman feet. Barefoot CaveWoman now like rhythmic antelope. Barefoot CaveWoman run on smooth yellow line as many times as possible to save feet. Barefoot CaveWoman look around. Some people walking. Barefoot CaveWoman just keep running. Nice people with shoe covering give Barefoot CaveWoman water. Water people like clothes of Barefoot CaveWoman. Everyone friendly; nice. Some mean women frown at Barefoot CaveWoman. Barefoot CaveWoman think women jealous of seasonal colors. Barefoot CaveWoman smile. She like to hear Father tell tribe legend story to Son. Big Dracula Man and Little Dracula man pass Barefoot CaveWoman and ask about bare feet. Barefoot CaveWoman tell them to visit blog cave where she paint barefoot stories and pictures on cave wall. She tell them where to find blog cave. What!?! Barefoot CaveWoman run faster than last time?!? Barefoot CaveWoman feel good. Barefoot CaveWoman smile! Yes! Barefoot CaveWoman knows what that is. Barefoot CaveWoman can run The Barefoot Mile! Meanwhile, Barefoot CaveWoman husband at finish line making lots of pictures of runners. Finally, he see Barefoot CaveWoman coming far away. Take closer look. Foot-cover woman with hat helping runners at end of race. Barefoot CaveWoman see husband. Barefoot CaveWoman start waving club. After race, Barefoot Cavewoman husband very tired from picture-making. But Barefoot Cavewoman need pictures of feet bottoms for blog cave. Barefoot CaveWoman surprised. Little stone embedded in ball of foot and little blood spot under stone. Barefoot CaveWoman never felt little stone. Do not worry. Barefoot CaveWoman will be okay. Barefoot CaveWoman also need make picture in front of big city caves. I dug this picture out of my old photo albums. 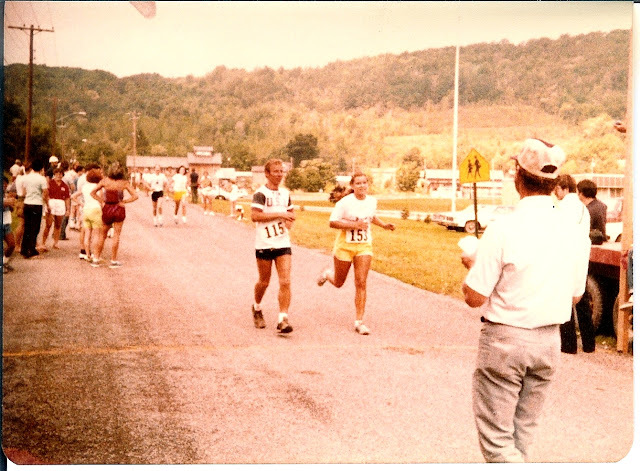 Yup, that's me -- in the past -- 1981 to be exact -- completing my first 10K, with the help of a dear running mentor and friend who was an ultra-runner. The weird thing about this race was that I, the girl who had come in last in practically every cross country meet a few years before in high school, came in first place in my age group category that day. I have a trophy for it in some attic somewhere. I can't tell you my time, or what race this was. I wish I had known back then that someday I would want to know. 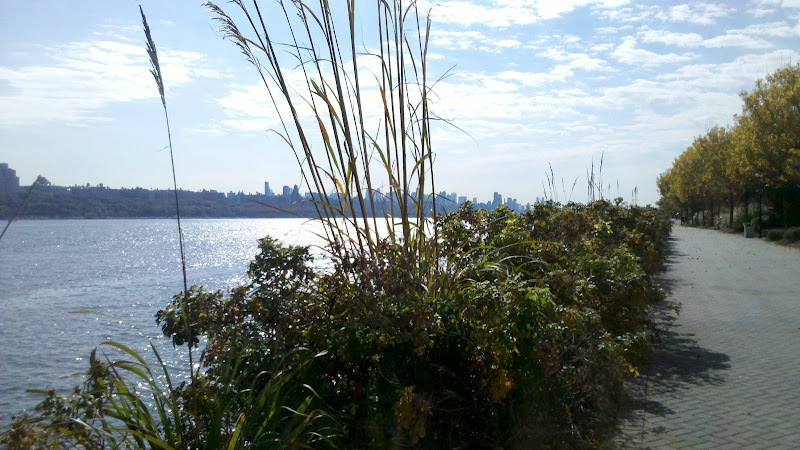 I never forgot that running I did so long ago, and, as I've mentioned on this blog elsewhere, I would love to return -- get my run back. That girl in the picture had no idea what was to come. That she was one day going to gain over 100 pounds. Wow, if someone had told her she would have freaked out. That was her worst fear back then, and she probably, in the moment of this picture, figured she was way ahead of the game at preventing her worst fear from ever happening. Well, I have to tell you that I never, back then, had thought I was very fashionable as a runner. I think I just wore whatever shorts and T-shirts were in my drawers. But recently, when Barefoot Neil Z posted his Halloween Howl Race Report, he showed this picture of some runners dressed up like 80s-style runners. I saw the shorts, the ones with the white trim and the little notches in the sides, and it brought back memories. Yes, I had shorts like that. Sure enough, you can see the same style shorts in the photo. That summer of 1981 was the best running summer, besides this past barefoot summer, I had ever had up to that point. I had been afraid of running before that. I would get sick before I went out. I was afraid of the pain. I almost fainted before all the cross country races, and I would not push myself at all. Girls who were stopping for walk breaks were beating me. But that summer of 1981, I was trying to mend a broken heart. I decided that the pain of running was easier to take than the pain in my heart, so I just went out running every morning. Soon, my mom found out there was this guy who was an ultra-runner and we were introduced and he became a running buddy for me. He would come running with me at my slow pace, and just talk the whole way. Every day we ran a little further and a little further and before I knew it, we were running 12-13 miles a day and it was easy and it was fun. One of the best memories I had of it was that we ran out on this country road and down this tree-lined lane to this place where there was a pump that pumped up cool spring water. We would stop there to get a drink and that water tasted better than any water I've had since. When I would run out alone, I would always stop at that pump, and I just loved knowing where it was. But today, I don't think I could find it. I cannot remember where on earth it was. One day, he got a bunch of his ultra-runner friends to come for a run with us. We ran and ran and I never felt tired. We ran out to some diner in the middle of no-where and we sat down for this amazing pancake breakfast with lots of good food. When we were done we got up and ran home. At a certain point, my ultra-running buddy told me about the 10K and said I should run it. So I signed up and then I did. It must have been at the end of the summer, before I had to head back to college. I tried to keep my running up on campus, but it was spotty from thereafter, and eventually died away. 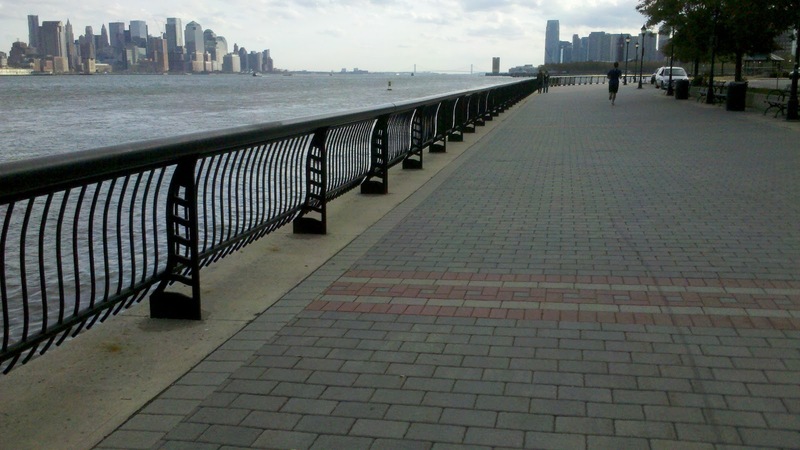 The run with Chris McDougall this past summer from Harlem to Brooklyn reminded me of the kind of running experiences I had that summer. In fact, when I spoke with the author as he signed my book, I told him about this memory that I'm writing about here. I got kind of choked up and got tears in my eyes. I didn't expect that to happen, but thank God he was very kind. He seemed to understand. Well, anyway, that's the kind of running I want to do. And barefoot running is my way to get back to that place. I have a long road ahead of me. I have to be patient. I've got to lose some weight. I have to keep at it and the progress is slow. But I'm going to try to continue to chronicle this little dream I have on this blog. As I go along, I hope you'll stay reading about the adventure with me. It might take a long time, but I just want to get back there. It’s been in the 70s this week, so I still don’t have to use any kind of shoes yet. However I have heard that the temperature is dropping tonight and it will be cooler. I very much would like to keep my plan to try the race barefoot, so if it’s a little cold I’ll have to deal with it. I know these pictures might be a little boring, but I’m kind of experimenting with the camera on my Droid and uploading to Picasa AND using the Picasa add-on for Windows LiveWriter. Bear with me because it takes me a long time to figure everything out. I like the way the Droid pictures come out. 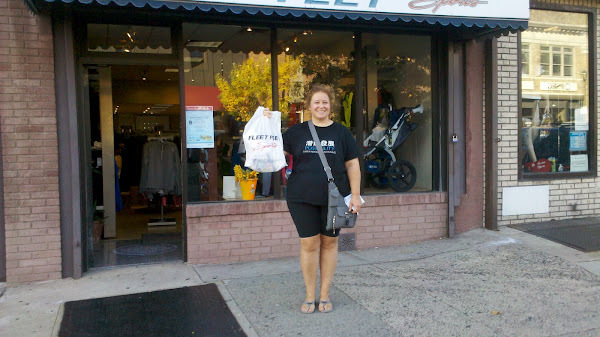 After that I headed over to Fleet Feet in Hoboken to pick up my race pack, T-shirt, and number. I had received an e-mail saying that the T-shirts were first come, first serve. One of the perks of being a mom-at-home is that I can beat the crowds to this type of thing. There were only two people in the store when I got there, and boxes and boxes of new T-shirts on the floor. Last summer I had joined the No Boundaries running club there and trained for a 5K in the summer with them. (To read about that a little bit, you’ll have to go to my Avocational Singer blog to the post “Being True To One’s Self”) I had done that as part of training for what I thought would be a half-marathon, but which ended up with the disastrous horrible case of plantar fasciitis. Inside the store was the coach from the running club. He remembered my name, and asked how my running was going. I had to update him about the plantar fasciitis, and, of course, tell him that I’ve started to run barefoot. It was a little weird talking about this with all the shoes hanging on the walls around me. I have to admit, from force of habit, my eyes went over to gaze at all the pretty running shoes gleaming and sparkling on their little shelves. The coach was very interested, and got me talking a bit about it. I ended up giving him the address to my blog and it’s possible he’ll check it out. I asked if they would be carrying any minimal-type shoes at any point. He told me they would be getting a few in for the Spring. “But I need them for winter to keep my feet from getting cold.” He said they would be there in January. I guess “Spring” in the running shoe business means January. He said they would carry the Nike Free (but … but, technically that one is not considered minimal, but merely reduced), and the Minimus by New Balance. He mentioned one more shoe whose name I did not recognize. I really like them in there. 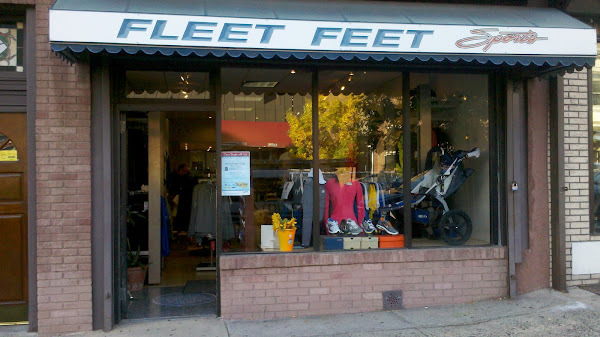 I’ve always liked this little Fleet Feet store. There is a real community feeling in there. But I don’t think I can wait until January to find something to wear in the winter. I had been planning to wear my Vibrams, but I have heard that they are not that warm (in that case, why not just be barefoot?) and that they slip on wet surfaces. I will give the Vibrams a try at least, and not go merely by hear-say, but I think that’s probably going to be right. The last thing to show you is the bag of stuff I got. This is a fun part of races is getting a bag of stuff. I have looked at so many bags of stuff on other blogs, and it’s really dumb, I guess, but for some reason getting the stuff is part of it and I had to take a picture. The long thing over on the right is a bed-and-bath item – a back scrubber! Some runner fuel stuff – stuff I don’t need yet because I don’t run that far. A pen! Coupons. When I saw the race tag, I realized that I’m going to have to do what every barefoot runner has to do at one point or another once he/she starts entering races – figure out how to attach that tag to my feet. As I’ve read other blogs, I’ve kind of skimmed over that part and not paid 100% attention. Barefoot Angie Bee has an adorable way of tying the tag on, but I’m not sure I can figure it out. I’d probably tie it too tight and be uncomfortable the whole way. BTW, when I saw the Nuun rack sitting on the counter, I thought of Barefoot Angie Bee (because she is a Nuun rep and that’s where I first heard of it.) Seeing the rack made me feel like she was there or something, and the store owner saw me look at the Nuun, and I said, like a an excited kid, “That’s Nuun!” And he was like, “yes … it makes an electrolyte drink.” But that’s not what I meant. I wanted to say that someone I knew was a rep for that, but then I realized that I didn’t know her, actually. It’s hard to explain how you feel like you know someone when you read her blog. One last thing. In my bag-of-stuff there was a little postcard for the women’s running club that is hosting the event, the Hoboken Elysianettes Running Society: No Runner Left Behind. The post card advertises their second annual New Member Run and encourages women to come out. HERS has a “no runner left behind” policy and will match new runners with people running similar distances or paces. I kind of longingly looked over their schedule. It would be nice to be in a club and have some other women to run with. But then I remember that even if I joined, I would not really be running with them all. That’s the frustrating thing about being so slow. Even when I meet new runners who say, “I’m slow,” they are usually faster than I am. I think I cannot join a running club until I can run at least a 12-minute mile. That won’t be for a while. A Practice Run -- HoBooken 5K Course -- Barefoot Mile 107 or so. 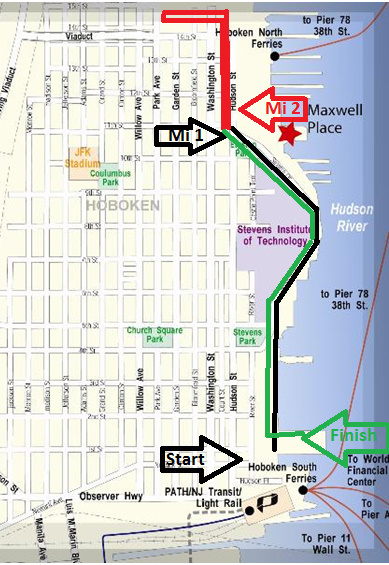 The plan for today: Run the HoBooken 5K course to practice for Saturday. I don't know if you were paying attention or remember, but I wanted to go back and run the 5K course and run on the road as much as I could to see how things felt. I had thought I might go back without Daffodil, my dog, because it was dangerous in the road with all the traffic. But I realized now why she's been so hyper. If I don't take her out for her exercise, she doesn't get it. No one else in the family will do it. I didn't bring her on my spontaneous run the other day, so she missed a day and needed to get out. How could I deprive her of this adventure? I arrived at the scene of the upcoming race and got myself going. I didn't run it from start to finish. It's an out-and-back kind of race, so I started in the middle and ran to the start and then to the other end and then by the middle again. 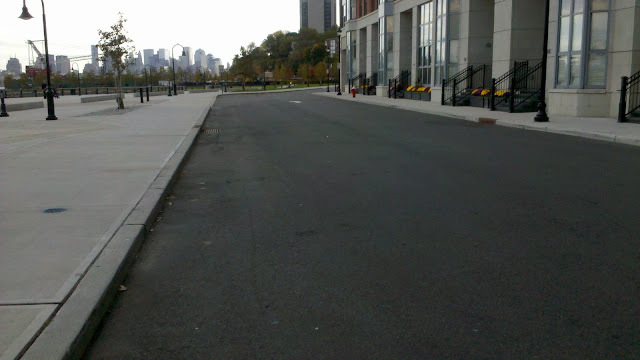 I ran some extra because there were some streets blocked off. Not too much extra. It ended up being about 3.5 miles altogether. There were also some of the blocked off roads with lengths of the asphalt that were helpful to the task. 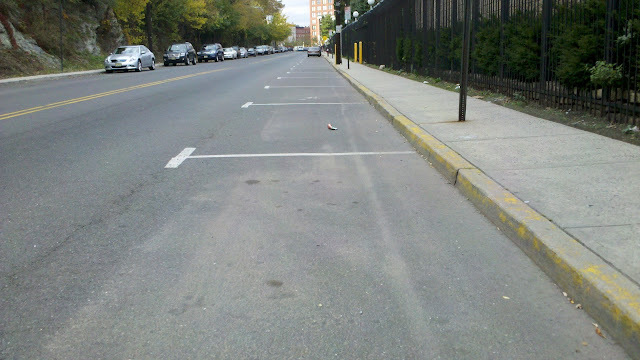 There's a yellow line in the middle of the road just in case the asphalt gets too rough. Also, I think I'll stick to the middle of the road because it's smoother and because there is a LOT of broken glass along the edges. I'm not going to mention to the race organizers ahead of time that I'm running it barefoot. I don't want to jinx it. Maybe I'm paranoid, but it seems to me that if they have time to think about it they might tell me I can't do it. They have a Facebook page and they are sending out status updates about the race, and I keep holding back from making a comment about running it barefoot. I think the best way to do it is to just show up and do it, like I did for the last race. Of course anyone could just find out from reading this blog! I finished the whole thing in about an hour. That was 3.5 miles in an hour. Yes you heard that right. But it might have been less because 1) I did not really check the exact time when I started and estimated it was 3:30, 2) I walked for about five minutes before I started, 3) I stopped a few times to take pictures. So, maybe it was less time. I finished right at 4:30. Now the only thing left is to do a couple of light runs later this week, and then have a lot of fun on Saturday. While I'm waiting for the photos to get here from my mobile upload I'll write about today's run. I can't believe this happened again but it did. I got the urge to just go run right while sitting in a parking lot waiting for a family member to be done with an hour-long appointment. I was wondering if I would be able to squeeze a run in today because I had to take a Kung Fu class, and then we had a Kung Fu graduation later in the afternoon. At the graduations we usually have to get up in front of the spectators and give a demonstration with our class. The graduation is not as taxing as a full class, but it still takes strength and energy. So, there I was thinking that I might run after the whole thing was over. But in between, there was an hour to kill. I had brought along a book and my binder full of choir music to study. As I sat in my car thinking about whether I would go inside or just read in the car, I started to almost doze off listening to a song on the car radio. When my head came back up and I opened my eyes, there was someone running in front of me. It gave me the urge to just get out there. Can I? I wondered. 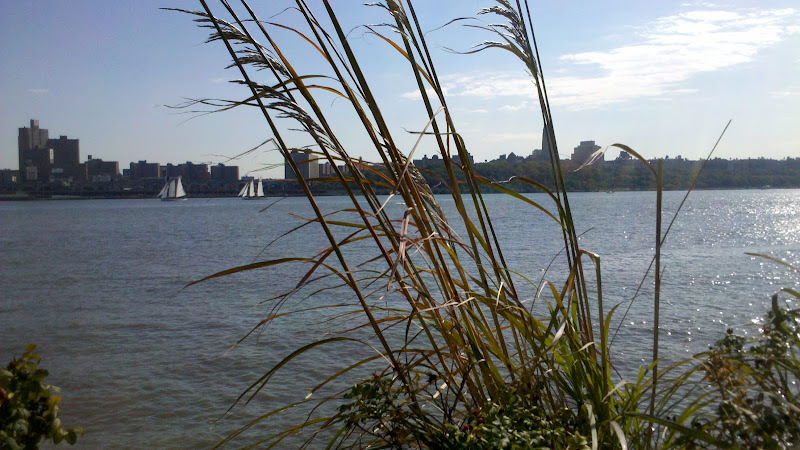 Can I just go out and take a run along the river? (It was the same spot I wrote and posted pictures about here.) I was still in my Kung Fu clothes, and a pair of flip flops. I thought it over a bit. “I can just carry them,” I thought. “But I don't want to walk across the parking lot and back in my bare feet” (just didn't feel like it). “Sure, just do it – but you’d better go now -- you're running out of time” (only 45 minutes left). Well, I got myself to the walkway, took off my flip flops and started running. Just like that. In the beginning, I was struggling with the flip flops, cell phone, car key thing. But eventually I had the brilliant idea (which probably should have been obvious) that I didn't have to have the palms of my hands facing down necessarily -- which would be something I would consider a "proper" position. I could turn them upwards! I then was able to kind of "wear" the flip flops and the cell phone was kind of comfortably wedged between the straps in my left hand, and the car key was kind of wedged between the straps in my right hand, and we were all relaxed and it was good to go. In fact, I didn't really feel too much difference with my palms facing up as facing down. It is hard to describe how beautiful it was out there. I felt so strong. I would have thought it wouldn't feel too good after having completed that earlier Kung Fu class full of circuit training -- 3 sets of jumping jacks, crunches, pushups -- and Kung Fu moves -- punching, stance work, form practice -- but I was doing very well. I guess my conditioning is coming along. I would like to develop an overall athleticism. I have a kind of ideal in mind. But setting out to develop this has been quite a project. I am actually working on a set of blog posts that tell the story of it. I would have hoped to have been further along by now, but more and more I'm realizing that getting conditioned and developing athleticism takes a lot of patience and a lot of time. I didn't get completely out of shape and very overweight overnight. It was the result of many years of practicing a certain lifestyle that leads to that result. Likewise to reform one's metabolism and physical makeup -- especially when starting late after many years otherwise -- is something that just doesn't happen over night. For one thing, who really knows how to do it? A person can have an idea of what they want, and read and try to figure out what to do first and how to get there, but as the person proceeds, as I've found out, it can be a jagged and uneven and unpredictable path. So, back to my intention to add running on to my fitness pursuits. I kind of thought I'd just go along with Kung Fu and keep getting stronger and better and faster there. But the addition of the running has inhibited that. I have finally settled for maintenance with the Kung Fu. I've basically been working out in Kung Fu to keep my level, but not advance while I do the barefoot running. But today was a good sign. I ran two miles out there after taking the morning Kung Fu class and felt pretty good. Maybe I could trade places with my focus and try to maintain what I’ve gained in barefoot running over the winter, and start upping the Kung Fu workouts for growth. Gotta’ think about that. Then, I had to go directly from there to the Kung Fu graduation. Oh well, if I did, I'll just sit the demo part out. That's not too cool, but I have to do what I have to do. I am learning and experimenting with my limits and recovery times and this will be part of getting to know about that. I'm not doing this to impress anyone. I am trying to find my way. I was pretty drenched from the run. I didn’t feel like I was sweating too much out there because it was cool and there was a breeze. But now that I had stopped, and went inside the Kung Fu school, I was very sweaty. I had to put on my dress uniform, which is long-sleeved and hot. We had to sit cross-legged on the floor in a line with our class until it was our turn. This part is always embarrassing for me, because I have a hard time getting up from the floor when it’s time to run out there and do our routine. Yes, I do. I have a hard time getting up off the floor. Even though I can do kind of amazing things for my age and weight in Kung Fu, there are still so many limitations. That is why I am longing for a fuller kind of athleticism, a more functional kind of fitness that can enhance my daily life, not just specific fitness that trains me to do certain tricks but leaves me non-functioning elsewhere. It is my dream, actually to be strong enough to move around gracefully within my life, within the ordinary tasks of life. I think this can still be done – that it’s not too late. But maybe it’s just a pipedream. And I did. And it was fun! What was great about today is that I found out I can do a little more. I can do a little Kung Fu and run on the same day. I most certainly would not have been able to do that at the beginning of the summer, so it’s very good. Progress is good. I got a little behind in writing up my miles. One purpose of this blog had been to be a running journal of sorts just for me, and I have been pretty faithful about writing after each run. After the costume thing I got off track. I went for a run later that day but didn't get my little write-up done for it. 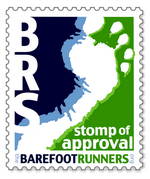 Right from the start blogging has been part of barefoot running for me. I have usually blogged about each run while it was fresh in my mind. In fact, as I ran along, it was the thoughts that sprung out of the run that wanted to come home and be set down on the blog. But I have to write about a run from three days ago now. It's not fresh. Yet to keep my blog going the way I first set out, I want to get it down here. I have had trouble with my last two runs. The first one, this past Wednesday, which I'm writing about here, almost didn't happen, and then was disappointingly shorter than I wanted it to be. And the second one, which should have been yesterday, hasn't happened yet. I got it into my head that I wanted to go run the HoBooken race course. This is the same course I ran/walked in the summer of '09 which ended up in making my plantar fasciitis much worse. I had a plan about what time I should leave to get over there with Daffodil, my dog. But there was a 20-minute period of time before I had to leave and I decided I could get the bathroom clean in that time. Once I got started, I took a little longer than expected to finish the bathroom. This resulted in my not getting over there leaving myself enough time to run the entire course. I only got to run about a mile and a half. I am really glad I went over there, however. The running surfaces are rougher than what I usually run on. It looks like there is going to be a long stretch of rough road. Although I've been adding lengths of road (asphalt) on my runs, I'm not sure how I'll fare for a long distance on the road. 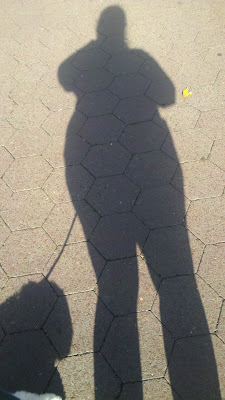 I had to run on the sidewalk along the course because there were a lot of cars and I had my dog. On the day of the race, they shut the road down. I remember that. I think I need to go over there a couple of times without Daffodil (how will she get her exercise?) and run in the road as much as I can during the run. 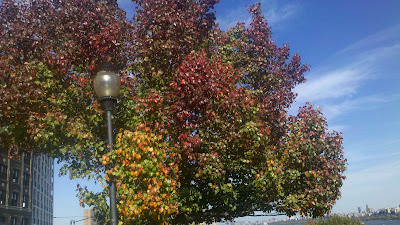 I planned to go out there yesterday, but there was no time or leftover energy with all the tasks I had to get through. I had a big task to accomplish that necessitated driving an hour and a half each way, and then I had a big extra choir practice last night. I had intended to squeeze the run in between the giant task and the choir practice, but -- well, in life you have to pace yourself as well, and based on what I knew I was going to have to do today, I couldn't get out there for my run. Well, I am about as far from an elite runner as you can get without being a non-runner. So why pay attention to what the elites do? Because I believe that all good practices are present at the lowest levels. My maximum ability is my maximum ability and in order to become stronger and/or faster (does that equal better? ), my task is the same, even if on a lower level. I have to push past pain too -- to run a 14 minute mile. That's my reality. Maybe the pain is of lesser degree, and it's all happening on a lower level, but it's the same basic task. So, running on the race course a few times will be useful I'm sure, especially if it gets my feet toughened up for a rougher surface. I hope I can get there today, but it will depend on how I feel after Kung Fu. I have run before Kung Fu before and then the Kung Fu didn't happen. Maybe Kung Fu before running will be a different story because my body, after three + years is more acclimated to the Kung Fu. I shall let you know, of course. Once you take your shoes off, all kinds of crazy stuff starts to happen. But I told you all that I came across this costume in a store and impulse-purchased it. I have good sewing skills, and I probably could have made a costume, but I wouldn’t have because this just had to happen the way it did – spur of the moment – or I wasn’t about to get inspired. The costume is lightweight, stretchy, and really comfortable so I think it will do for a run. This cave woman was/is obviously a good enough runner to catch plenty to eat for herself and her tribe, lol! I’m not sure the wig will stay on. I’ll have to pin it pretty well and I don’t know if I want to run with all those bobby-pins. On the other hand, if it’s cold it will keep some heat in my body so my feet won’t suffer (you know how they always tell you you lost most of your heat out the top of your head!). I laughed so hard when I saw myself in the mirror I just had to go outside and get some photos. The next thing was trying to hold back from showing all of you. I wanted to save it for an interesting blog post on race day. But the photos came out so cute I didn’t want to wait. So, here is a barefoot costume for my upcoming race! I think my next step is going to have to be to go on the paleo diet or something.